StoneTech High Gloss Finishing Sealer protects and transforms the surface to a high shine finish.ÊAlways test in a small inconspicuous area to determine appropriate application method, achievement of desired results, and to ensure good adhesion. Ensure work area is well-ventilated during application and until surface is dry. Keep children and pets out of the area until the treated surface is dry. Avoid applying product in direct sunlight. Surface temperature should be 50 ¡FÐ80 ¡F (10 ¡CÐ27 ¡C). Surface must be thoroughly clean, dry, and free of any sealers or coatings before application. Application to a dirty or dusty surface will affect adhesion and appearance. High Gloss Finishing Sealer should not be applied to a wet or moist surface. Avoid applying onto surfaces not intended for treatment. For new installations, sealer can be applied as soon as 48Ð72 hours after grouting. Fresh concrete slabs require a minimum of 28 days to cure before applying the sealer. Expected wear is up to 5 years. Touch up on higher traffic areas may be required on a more frequent basis. Up to 300 sq. ft. of coverage per gallon, depending on porosity of surface. 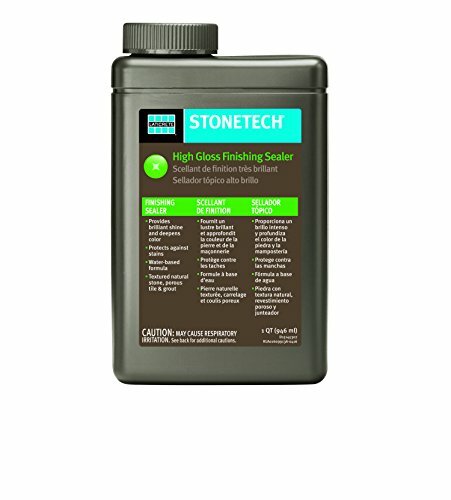 Includes: 1 1-Quart (.946L) StoneTech High Gloss Finishing Sealer. If you have any questions about this product by StoneTech, contact us by completing and submitting the form below. If you are looking for a specif part number, please include it with your message.